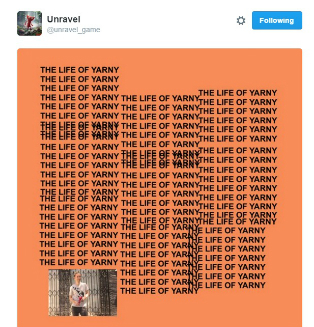 Ah, yes, good old Yarny. You either love him or hate him. 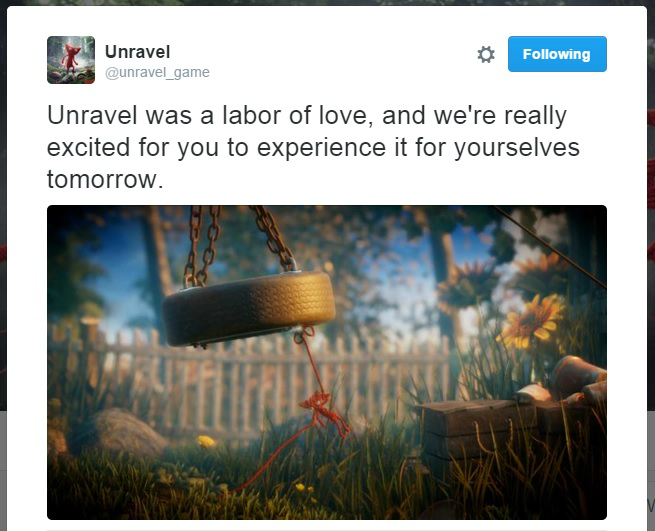 Regardless of whether you want him to burn in hell or give you a big woolly hug, the official Unravel Twitter can give us many insights about what to do with social media. Yarny interacts with his friends. 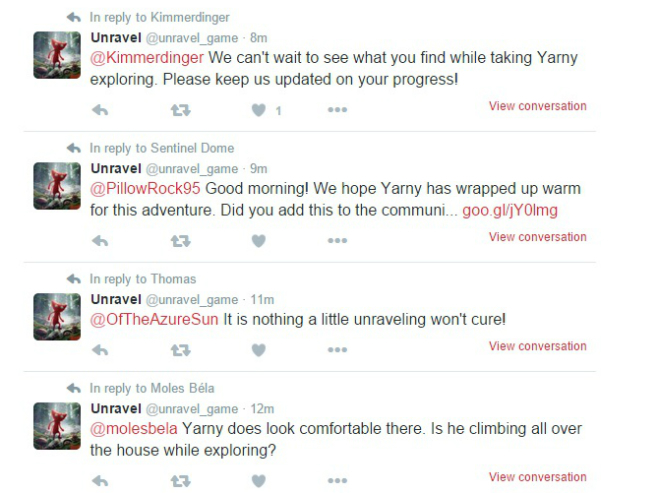 From what I can tell, the Unravel Twitter makes sure to respond to everyone who talks about Yarny–with customized responses, to boot. Many professional social media don’t reply to the comments on their accounts or use canned reponses, missing the chance to build rapport with followers. 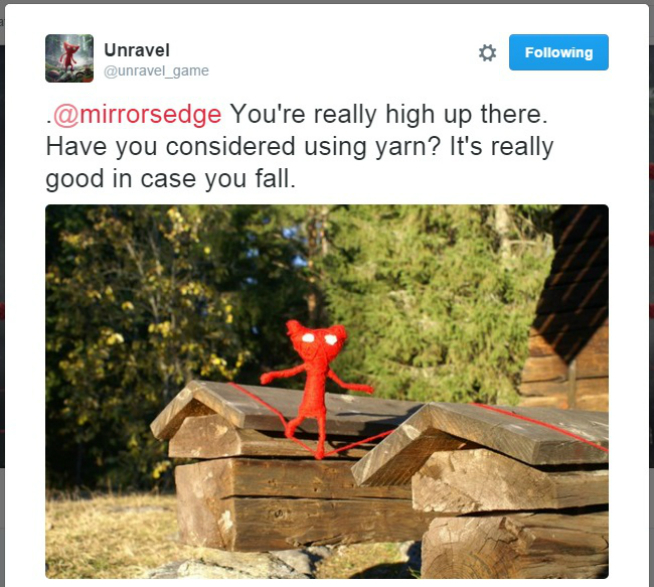 Yarny keeps up with current trends. 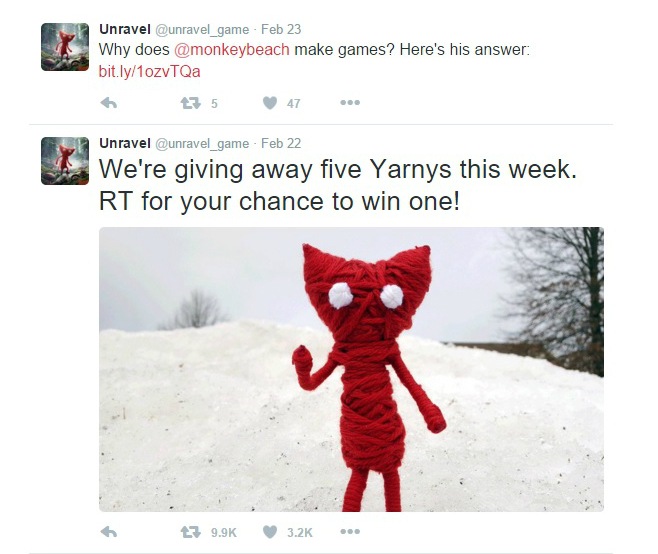 Yarny connects with other video game’s Twitters. However, Yarny doesn’t acknowledge negative criticism. If you keep up with gaming criticism, you’ve probably heard of Clayton Purdom’s piece on Unravel, titled “Burn in hell, Yarny.” It came out the same time the game itself did, and lots of critics had something to say about it. Yarny himself, on the other hand? Nothing. While you’d think that ignoring negative criticism is an ideal thing to do to present yourself in the best way possible, it’s actually a better idea to address it. This shows followers that rather than ignoring their input, you’re making sure their voices are heard. While the Unravel Twitter utilizes many best practices, this is one that they miss the mark on. For those of you interested in learning how to spiff up your own social media, I learned the basic concepts from the book Likeable Social Media. (I actually learned from an older version of it, which is now dirt cheap and probably has the same gist.) You’re also welcome to Tweet me at my own Twitter, @LongLiveMelKing, with any questions you have! While we’re talking about social media, have you followed Unwinnable’s Twitter yet? It’s what the cool kids do.